Traveling with your kids is always fun, but sometimes it’s nice to plan a getaway for adults. Cabo is one of the most family-friendly destinations, but you can easily turn it into a perfect vacation for adults. There’s tons of tours in Los Cabos Mexico perfectly geared towards adults, so check out these popular activities. Cabo is a fabulous party destination for more than college students. Adults from all over the world travel to Cabo for some luxurious fun. Join a party cruise to meet some new people, and enjoy delicious food and drinks. Party cruises are easily one of the most popular tours in Los Cabos Mexico because Cabo already provides such a fun atmosphere. Combine that with drinks, music, and entertainment, and you’re guaranteed to have the best night! 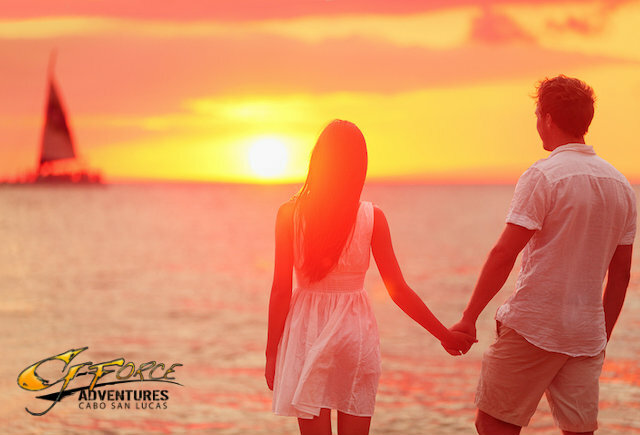 A sunset cruise on a luxury catamaran is just the way to kick off your fun, romantic night with a partner. Enjoy food prepared freshly right in front of you. As a dinner cruise, it’s a great start to your night. Feel free to pursue other activities after the dinner cruise like going out on the town or walking along the beach. Imagine bungee jumping into the canyons of Cabo. Experience these heart-pounding thrills that may even force you to face your fear of heights! Since you definitely can’t bring the kids on this tour, it’s a great one to take advantage of when you’re with friends, a spouse, or partner. Horseback riding on the beach at sunset is a very romantic addition to your adult getaway. 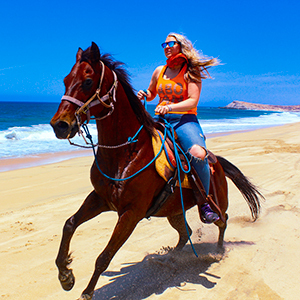 Enjoy the relaxing tranquility of Cabo sunsets as you ride majestic horses against the soft waves. Kids might get bored on horseback rides, so it’s a perfect time to take adventure of being kid-free. While these are some popular tours in Los Cabos Mexico for adults, you can really do any tour. Create your own schedule, and relax at your leisure while visiting Cabo!